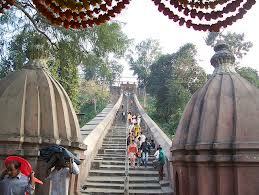 Here is Some Information about Hayagriva Madhava Temple in Hajo(Gauhati) Assam India. 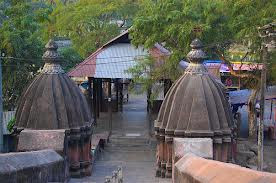 Hayagriva Madhava Temple is situated on the Monikut hill. 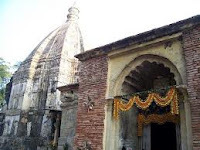 The present temple structure was constructed by the King Raghudeva Narayan in 1583. According to some historians the King of Pala dynasty constructed it in 6th century. 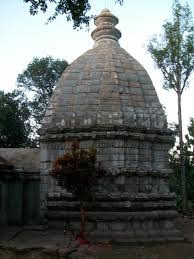 It is a stone temple and it enshrines an image of Hayagriva Madhava. Some Buddhists believe that the Hayagriva Mahhava temple, best known in the group of Hindu temples, is where the Buddha attained Nirvana. At this imposing temple, the presiding deity is worshipped as the Man Lion incarnation of Vishnu by the Hindus.It is a stone temple and it enshrines an image of Hayagriva Madhav. The rows of elephants are seen on the body of the temple and they are fine specimens of Assamese art. There is a big pond known as Madhab Pukhuri near the temple. Doul ,Bihu and Janmastami festivals are celebrated every year in the temple. Moreover this temple preaches both Hinduism and Buddhism, which attract Buddhist Monks from far flung places. Sayani, the first wife of Kalia Bhomora Barphukan donated a family of paiks and also a plot of land for their maintenance to the Hayagriva Madhava temple during the days of Purnananda Burhagohain. There are a number of legends regarding the incarnation of the Hayagriva Madhab. It has three versions while the local legend relates the Avatara to the epic of Mahabharata. It claims that when Vishnu was sleeping and Lord Brahma was on the lotus, two demons Madhu and Kaitabha took away the Vedas from Brahma and went to Rasatala. Lord Brahma, being much aggrieved, awoke Vishnu, and requested for the recovery of the Vedas. Vishnu assumed the form of Hayagriva and recovered the Vedas, and handed over to Brahma. He then went to sleep in the northeast in the form of Hayagriva when he was challenged by the demons for a war in which they were killed. According to Matsya Purana, the Hayagriva Avtara of Vishnu was similar to the Matsya avatar which he took when the worlds were burnt down. Vishnu in the form of a horse recompiled the four Vedas, Vedangas, etc., the Devi Bhagavata and the Skanda Purana in its Dharmranya Khanda. According to Kalika Purana Vishnu took the form of Hayagriva to kill the Fever-Demon, Jvarasura in the Manikuta hill and lived there for the benefit of men, gods and Asuras. He then took a sacred bath to avoid all vices which come in the form of diseases. 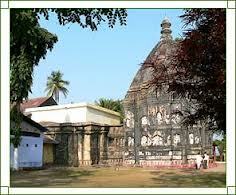 Hayagriva Madhab Temple is also known for its general layout and its architecture. Built on a small hillock, the temple has a flight of stone steps composed of slab(s) leads to the main grounds of the temple. 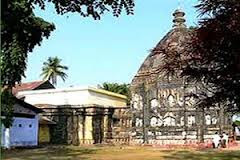 The temple is built in stone in an octagonal shape which is about 30-feet in diameter and crowned with a pyramidal roof. It often appears that the upper portion of the temple has been reconstructed from the old (earlier) materials, without much resemblance with rest of the architecture. In its vertical elevation, the temple consists of three parts, the high basement, the middle portion of the temple and the Sikhara. 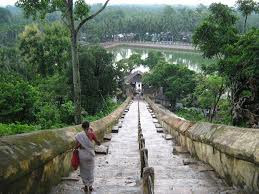 It has the sculptures of row of Elephants or `Gajathara`. At a height of 2-feet above the plinth, a row of caparisoned elephants are encircled. The images of elephants, all tuskers, are facing outwards, each standing 16" in height, which are finely designed and executed showing only their tusks, trunks and front legs. The basement moulding is identical with the decorative style that resembles with `Kailasa` cave temple at Ellora. The Garbha griha is 14 feet square shaped crypt, into which one can descend by a flight of stone steps. It contains the image and its platform. The shrine is formed of four blocks of granite which is ten feet high by five feet wide. While a lotus over the door, it opens into an anteroom. Also there is a stone screen, ten feet by ten feet, having niches of four feet square, one on each side with apertures for the admission of light and air. This is shaped in the form of lotus flowers. The temple has a Sikhara which has a pyramidal plane face, which continues right upto an apex point. The temple, it has large vestibule measuring 40 feet by 20 feet built of brick in the horizontal aspect which resting on massive brick pillars. This is a new addition to the original structure, constructed by Naranarayan, the Koc King in 1550 AD.